The planet Uranus aligned with Pluto on October 9, 1965 at 4:17pm Eastern time. They met up at the 17th degree of Virgo 09 minutes. That was 47 years ago. A new conjunction of two very powerful planets – promises were made. Both Uranus and Pluto are quite explosive planets; Uranus wants to disrupt the old and replace it with the revolutionary new, while Pluto is all about death and rebirth. Put the two together, and you can see why the Sixties were so powerfully revolutionary. This pair traveled together basically from 1961 through 1969. Remember much revolution then? 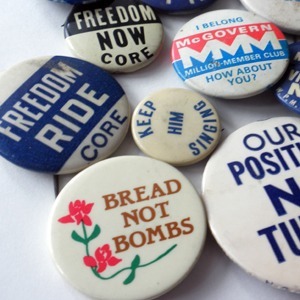 In 1965, we got Medicare and Medicaid; 1964 The Civil Rights Act; and the Beatles revolution. Conservatives shook in their boots as they watched the young grow their hair and every step John Lennon took was chronicled and photographed by the FBI. Those dangerous sit-ins. The Voting Rights Act of 1964 was established, too. By 1969, I knew it was over: my best friend got sent home for wearing bell-bottom jeans to school. The “establishment” was done for. Hendrix, Joplin, and Morrison died – so did the Beatles and the Woodstock generation. That’s what Uranus does: it upsets and renews the establishment. Saturn stabilizes it, and then Pluto blows it all up again. A neat, tidy, necessary cyclical pattern of evolution. When Uranus and Pluto met in Virgo, the first time since 1850, they merged. They got married. Uranus promised to show tolerance and equality for all. Pluto’s oath was to show courage and get down to the real meaning of life. Since they were heavily colored by the SIGN OF VIRGO, the focus went towards Virgoan things: Unions, equal rights, racial equality, feeding the poor, healing the sick, etc. Now, 47 years later, Uranus is square or at a right angle to Pluto. It’s report card time. This is what is called the “opening square.” The opening square is a trial period. For example, the Sun’s yearly orbit, 90 days later is its opening square (90-day probation.) For Saturn’s 28-year period, the 7th year represents its opening square (7 year itch), for Uranus’s 84 year period, it happens at age 21… get it? So, now, in 2012, we are experiencing the opening square of transiting Uranus to transiting Pluto. As a matter of fact, due to retrogradation, this will happen 7 times; we just experienced the 2nd of 7 in September of 2012. By natural means, the PROMISE is being tested and evaluated. The opening square of any type asks the question, “How have we been doing with that promise? What does this all mean? Well, one cannot accurately analyze the opening square until one understands the marriage of Uranus and Pluto first. Simply stated, astrologically we have to combine Uranus (U), Pluto (P) and Virgo (V). And that means being tolerant of everyone’s way of life (U), being dedicated and strong enough to care about everyone’s passions and primal needs (P) and be sensible about it (V). How else can we describe this couple’s vows? “I promise to care for the unfortunate (V, and Chiron), to respect everyone’s right (even sexual) (U), and to wipe out any old, obsolete rules, mores and standards (P). Many of us have flunked badly and are still flunking, erroneously thinking that we can possibly treat the “poor” differently than the “rich.” In reality, making “them” behave the way “I” want them to be doesn’t do anything for “me!” Our faulty thinking somehow is based upon the assumption that we are separate. The same old problem. We simply cannot be One and Separate at the same time! So, this is PRECISELY why we’re having such tug-of-war with Medicare right now. Many of us are succeeding at keeping and furthering the promise. You don’t mess with the outer planets. You cannot win. Well, we could vanish actually – the Polar Cap is. In the chart done for the exact time of the Uranus/Pluto conjunction in 1965, Neptune lays almost perfectly AT THE TOP OF THE CHART. Do you think that’s a coincidence? That means that however we utilize Uranus and Pluto into the future, we will HAVE to do so with love in our hearts including all as one big family. One does not disobey Neptune and survive; it’s just not possible since it IS The Divine. Remember, this is the chart for the whole planet; not just Americentric! So, now you know why we’re going through what we are. Resistance is commonplace just before we take our next leap in evolution. I can remember my buddies and I following police cars around in 1969; after all, they consistently followed us! Revolutions come and go and there are plenty of victims to go around. Change is quite often very good for us. The opening square of Uranus and Pluto is not meant to represent finality; it is meant to express the necessary pain and friction required to get us back on track. This is not weird. This is living in accord with Nature’s laws. So, how do we get on board? By seeing all as having equal rights; by not pretending that this voter suppression is being done for any other reason than bigotry; by being color blind as far as all races; by realigning our country so that everyone can work and make a livable wage (V); by not prying into other’s bedrooms (P); by being willing to share (V); by having the courage to set a great example to the world (P); by becoming more self-sustaining (V,P); by furthering the work for our youth to be free them (U) from bullying (P) in all forms, and so on. It’s really not a stretch to see some large corporations as bullies, is it? This classroom knows nothing about giving automatic passing grades. We could flunk out big time. Remember, Neptune and Chiron are very intelligent and have at the same time bestowed their grace upon us while they are traveling together in early Pisces. This is no accident. All of these energies are culminating just as the Mayan Calendar comes to the end of a major chapter. Another coincidence? The very fact that we are all reading this and sharing similar perceptions is a very good sign. We must stop the forces that encourage us to hate and bolster the idea of “them.” There just aren’t any “thems” out there anywhere.